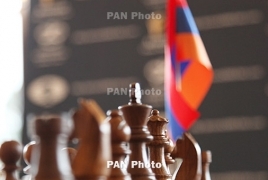 PanARMENIAN.Net - Eight Armenian chess players will participate in the European Individual Championship, set to launch in Skopje, Macedonia on Monday, March 18. Grandmasters Sergei Movsesian, Hrant Melkumyan, Robert Hovhannisyan, Arman Pashikian, Haik M. Martirosyan, Samvel Ter-Sahakyan, Manuel Petrosyan international master Shant Sargsyan will compete at the tournament in the Macedonian capital. The European Individual Chess Championship is open to all players representing the Chess Federations that are members of the European Chess Union, regardless of their title or rating. There is no limit to participants per federation. The European Individual Chess Championship 2019 is a qualification event for the FIDE World Cup 2019. According to FIDE regulations and the decision of the ECU Board, 22 players will qualify out of the total of 357 participants.